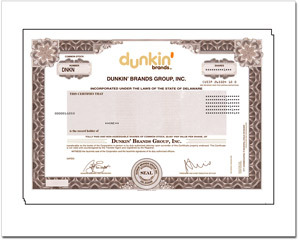 Dunkin' Brands Group, Inc, owns, operates, and franchises Dunkin Donuts and Baskin-Robbins brands worldwide. For those who kill for a donut and great coffee! Shareholder is NOT a U.S. citizen - no SSNO required. I'll phone it in asap. I know registration can't start without it. I want GiveAshare to include a SSNO Request Card with 1st Part so recipient can provide it later.